Below you will find some examples of our project work. Please do not hesitate to get in touch if you would like further information. In September 2017 MBELC was instructed by Neonova Design to assist in developing a proposal for a new driveway to serve Summerdown Manor, Wiltshire House and West Lodge, south of Effingham in Surrey. MBELC also provided a Landscape and Visual Appraisal (LVA) of the proposal to support the planning application. The appointment of MBELC followed the issuing of pre-application advice by Guildford Borough Council (GBC) which had raised a number of concerns with the applicant’s proposal. 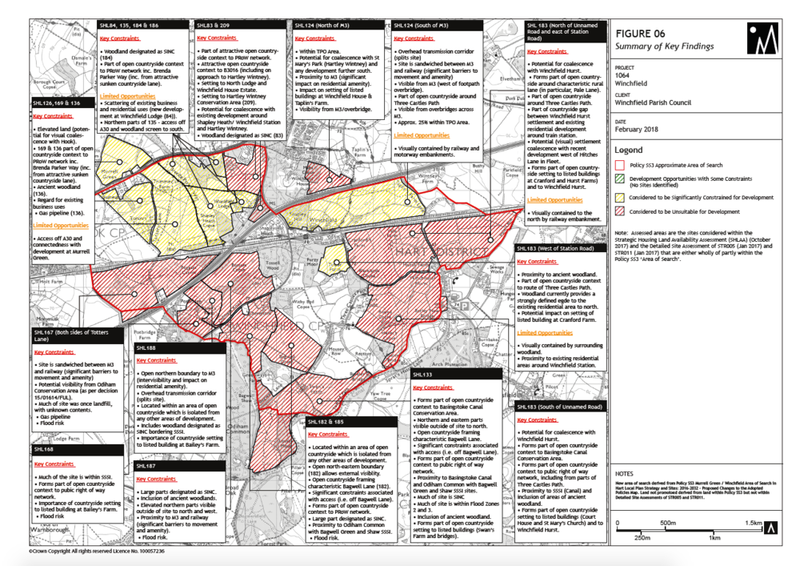 These included the potential impact on the Green Belt, Surry Hills AONB and Guilford Area of Great Landscape Value (AGLV). · remove an existing tarmac driveway. As a result of our design input we were able to alleviate GBC’s concerns and demonstrate that the proposal would conserve and enhance the special qualities of the Surrey Hills AONB; protect the distinctive landscape character of the AGLV; and be consistent with the objectives and purposes of the Green Belt. GBC granted planning permission for the application in April 2018. 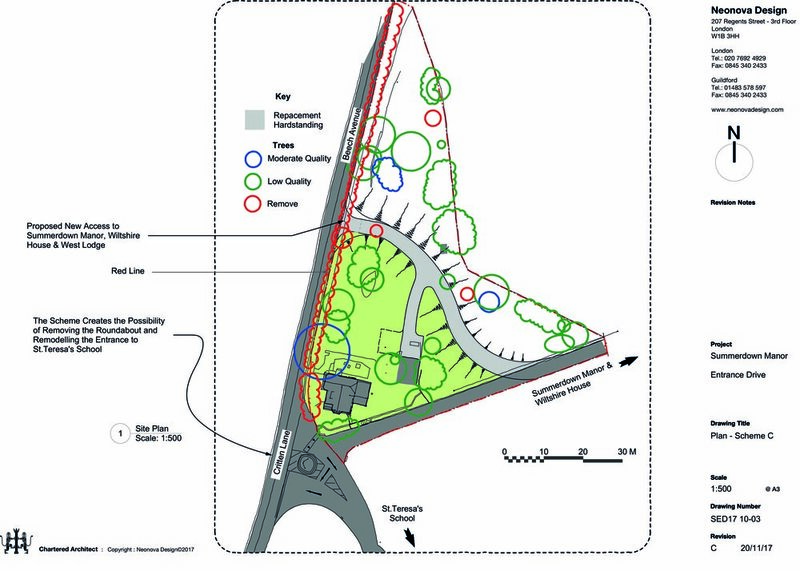 This success demonstrates the value of having a Landscape Planner involved in shaping the design of a proposal before an application is submitted - particularly when the proposal is located within a highly sensitive landscape. We prepared a report on behalf of Winchfield Parish Council which addressed the landscape constraints to an ‘area of search’ (AoS) for a new settlement identified in the Proposed Submission Version of the Hart Local Plan, February 2018 (Draft Policy SS3). The AoS includes about 75% of Winchfield Parish. Our report and its accompanying graphics demonstrated the valuable green infrastructure function of the countryside which comprises the AoS. Particularly for the residents of Hook and Fleet, and the surrounding historic villages of Dogmersfield, Odiham and Hartley Wintney. Our findings serve as evidence that the new settlement envisaged by Draft Policy SS3 would result in significant landscape and visual harm and be at risk of harming components within the landscape which hold high landscape, amenity, and heritage value. In 2017 Michelle Bolger gave landscape evidence on behalf of Braintree District Council with regard to an appeal by Gladman Developments Ltd, against the refusal of planning permission for up to 80 dwellings on land off Wethersfield Road, Finchingfield, Essex. Michelle argued successfully that the site should be considered a valued landscape with regard to paragraph 109 NPPF due to the contribution that it made to the character and setting of Finchingfield. Despite the fact that the Council could not demonstrate a five-year supply of housing land the Inspector found, on application of paragraph 134 NPPF, that the public benefits of the scheme did not outweigh the harm to the heritage assets. Further, he found that paragraph 109 NPPF to be a policy in the Framework which restricts development, and that public benefits did not outweigh the harm to the valued landscape. Gascoyne Cecil Estates (GCE), the owners of Hatfield House in Hertfordshire, are actively involved in the ongoing Welwyn Hatfield Local Plan process. As major landowners within the Borough they are promoting sites through the local plan process including an urban extensions, high tech commercial development and a new 'estate village' at Symondshyde. GCE are also promoting the development of a major corridor of Green Infrastructure linking Hatfield, Welwyn Garden City and Hatford. 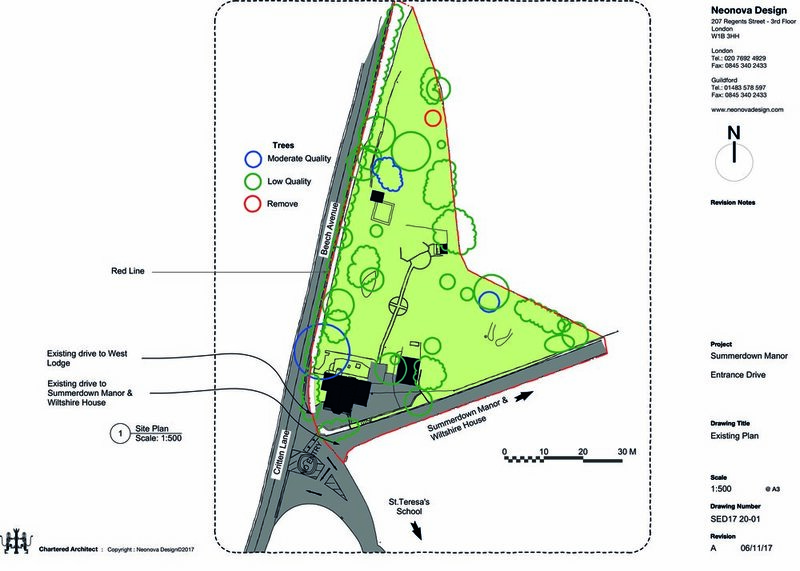 MBELC has provided a range of landscape advice for GCE including initial appraisals of landscape and visual issues and the preparation of a Landscape Vision for land between the edge of Hatfield and the new village at Symondshyde. St Osyth Priory is a heritage complex, including more than twenty heritage assets, near the coast in Essex. The Priory, which includes a Registered Park, is on the Heritage at Risk register. The current owners have been working for the more than fifteen years on enabling proposals to fund restoration of the buildings and landscape, and to bring the whole estate back into viable use. Michelle Bolger has been involved in the site since 2011 as part of a multi-disciplinary team, originally with Liz Lake Associates. She was responsible for the LVIA for enabling development which involved new buildings within the Registered Park and residential development on adjacent land. Michelle prepared and gave landscape evidence at two inquiries following the failure of Tendring District Council to determine the applications. Although the appeals were initially dismissed the decision was subsequently quashed and during the second inquiry in November 2016 Tendring District Council granted permission for revised applications. Michelle Bolger provided expert landscape advice for Derbyshire Dales District Council to support their refusal of an application for wind turbine development on a site close to the Peak District National Park. A scheme nearby at Carsington Pastures has been approved at appeal and the appellant argued that this indicated the site was suitable for wind turbines and the presence of existing turbine development reduced the sensitivity of the landscape. Michelle argued successfully that rather than reducing the sensitivity of the landscape the presence of exiting turbines had reduced its capacity for additional turbines. The inspector agreed with her description of the existing landscape character of the Griffe Grange Valley and her conclusion that the appeal site was important to the setting of the National Park.